Chris Crisman photographs acrobat for Cirque du Soleil and Infiniti in Montreal, Canada. “Acrobat” wins 3rd place in Altpick Awards’ Photography Single category. ” This image is from an incredible opportunity working with Cirque Du Soleil artists through German Agency KÖCKRITZDÖRRICH. We were working on a profile picture package for their client Infiniti and focused on the development of artistic perfection while working at the Cirque Du Soleil Headquarters in Montreal, QC. This particular artist was training on the parallel bars. 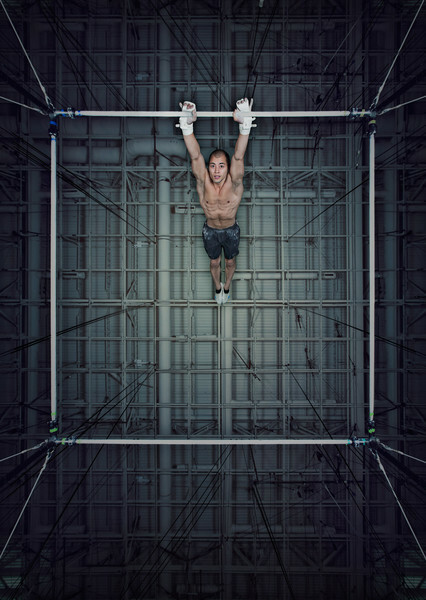 To get create this image and I had shoot underneath him as he did his rotations around one set of bars. It was a tough photo to capture as his feet were swinging within inches of my lens. Needless to say, I’m very happy we took the chance on this one. “, comments Crisman. To see more of Chris’ work go to his Altpick page or his website. This entry was posted in Photography and tagged acrobat, canada, cirque du soleil, infiniti montreal. Bookmark the permalink.